Following the latest post on mission drift, how can nonprofits effectively grow, adapt, and innovate for superior performance, while remaining aligned with their ultimate mission? Mission Driven Strategy is a set of guidelines for designing and evaluating strategy toward maximum, mission-based value creation. In many instances, mission-oriented models and guidelines are created within the bubble of the nonprofit culture. 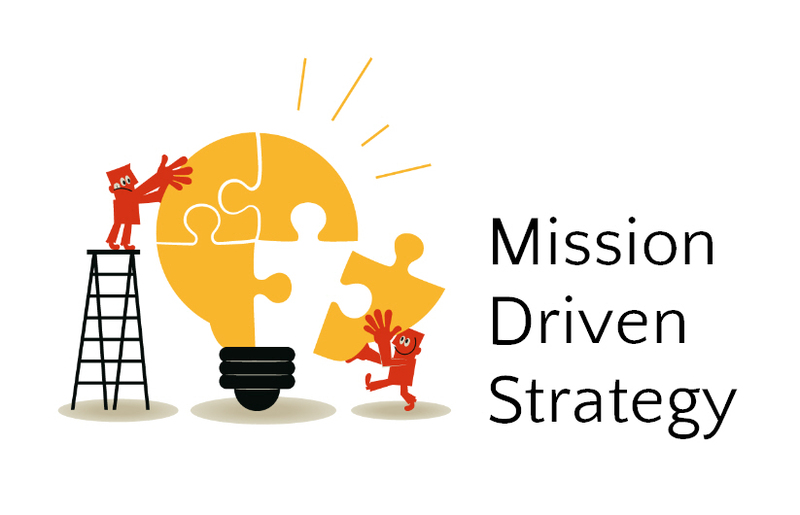 Mission Driven Strategy, however, was adapted from the for-profit model, Return Driven Strategy, authored by Mark L. Frigo and Joel Litman. Stepping back for a moment, if you are involved in a nonprofit, what does strategic planning look like in your organization? For many, if not most, nonprofits, strategic planning takes the form of an annual retreat where the executive or management team comes together to set a few (or a dozen) goals for the coming year. Very few organizations have a 5-year plan or tangible vision for the future and many are flying by the seat of their pants as they squeeze in the all-day retreat to check-off the annual planning task before they get back to putting out fires while fulfilling five other roles in order to keep overhead low. While our nonprofits are constantly focused on today, or even yesterday, successful for-profit organizations are positioning for tomorrow. Their products can become irrelevant overnight if innovative competitors get a few steps ahead of them. They therefore invest heavily in strategic planning. Mission Driven Strategy is simply one of many models which can help us gain a bigger perspective around strategy and effectively position our organizations for sustainability and increased social impact. As always, we must be cautious in applying overt profit-rooted models and methods to our nonprofit organizations, ensuring that we don't fall into the trap of maximizing revenue around our social causes while disregarding sustainable, positive impact. After all, the latter is why nonprofits exist. What unique or high value assets do we own? Examples could be our unique mission in our geographic area, an ideal location that is embedded within our constituents' community, or a staff comprised heavily of former constituents. What external forces are driving change for our mission now or in the near future? Consider scientific or technological breakthroughs; statutory, regulatory, and political change; and cultural and demographic shifts. Are we doing the right things for the right reasons? How can we adapt or innovate our models, delivery mechanisms, or infrastructure to maximize the value we provide? Do we have a clear understanding of our causes' needs? How have the needs changed and how will they likely change based on the trends and coming events? How can we best fulfill unmet needs in line with our mission or through partnerships? Where are needs increasing or acting as substantial barriers to mission-delivery? How are we uniquely positioned to impact the greatest needs our constituents face? The model authors recommend using the Balanced Scorecard model (Kaplan and Norton) for establishing metrics and tracking performance around your Mission Driven Strategy. The Balanced Scorecard tool was developed to help organizations integrate strategic objectives into daily operations, essentially connecting goals to tasks to measurements. A coming post will review best practices in applying the Balanced Scorecard to our Mission Driven Strategies. The Bottom Line: Considering how forces of change will drive unmet needs within our mission focus, how can we leverage our genuine assets to develop, deliver, and measure maximized impact?